173 apartments and Eight highly sought after penthouses alongside shops and offices in a stylish Modernist refurbishment. Just two miles from Westminster, Tate Britain and Millbank, This Space is a popular development by Mount Anvil Homes developed in 2009 around an existing 1970’s University building. 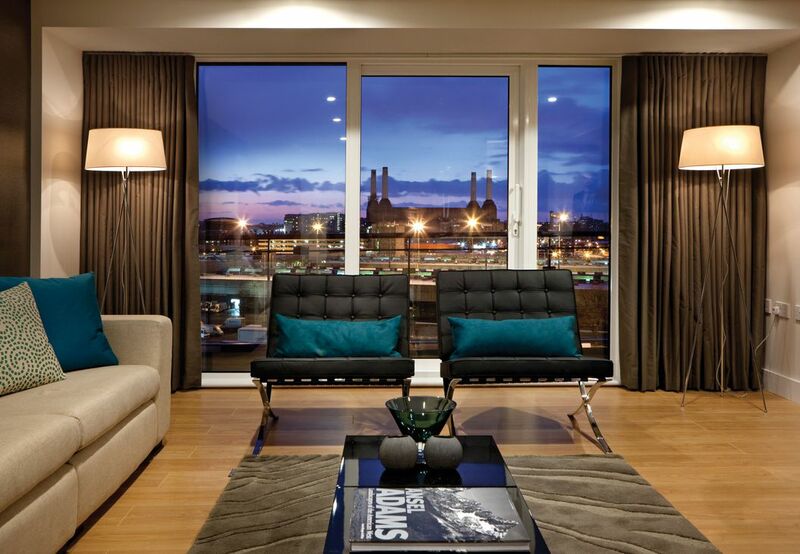 Situated on the fringes of the Nine Elms regeneration area, This Space has all the conveniences of the Nine Elms District and the benefits from the opening of Northern Line Extension nearby. Yet, This Space offers fantastic value for money being as it is on the ‘wrong side of the tracks’ for purchasers wanting riverside views from skyscraper apartments with sky high price tags. Instead, This Space is a true Londoners development, sold at realistic prices, and providing a hint of luxury living in an area that still has an air of grittiness about it that suggests there is great investment potential in those savvy enough to buy into the area. With supermarkets, schools, doctor’s surgeries and local pubs surrounding This Space and a gym within the development itself, This Space is attracts hard working, professionals that want easy access to everyday amenities. However, at night these same professionals want to close the door on the hustle bustle of life, and enjoy the cityscape views from the calm of their living rooms. Situated on the Wandsworth Road just a fifteen-minute walk from Vauxhall underground, and over-ground train stations and the bus station, This Space is a redevelopment of what used to be a purpose-built site for the Polytechnic of the South Bank, now known as the London South Bank University. Originally, the site housed the Polytechnics, Faculty of the Built Environment, which was at the time the largest in Europe and taught an array of subjects around property and estate management from bricklaying to surveying, architecture and town planning. That is true of the This Space development, which, when launched off-plan in 2008 saw buyers queuing up to view the show apartment and resulted in the development being awards the best selling south London Development 2009. This Space has been designed to include the best features of modernist architecture; floor-to-ceiling windows, spacious foyer, and on-site amenities. Other elements have then been updated, recognising the more demanding needs of modern, city living. For example, upper levels have been added as well an internal courtyard, and a number of the apartments boast large roof terraces. Communal spaces are generously proportioned and sofas are dotted about to encourage a sociable, neighbourly environment. Quite a contrast from some developments whose, poky, eerily silent corridors are more reminiscent of the Shining! Separate storage spaces are available to purchase, as are secure parking spaces. A 24-hour concierge offers security and the convenience of taking in deliveries while a Tesco Metro and a Pure Gym are situated at street level.The dramatic, cantilevered auditorium of the original polytechnic is now a fringe theatre and the developments façade has been softened with warm, terracotta-coloured timber panels. Although launched in 2008 and completed in 2009 there is still investment potential within the development as flats are perhaps on their second or third purchaser and therefore may benefit from a refresh in décor and interior design.With over 170 apartments from studios and one-and-two bedroom flats to larger penthouses, the development will always attract professionals working in Westminster, the West End, City and Canary Wharf. Even those that work out of London, in The South West, may chose to purchase in This Space as the proximity of Vauxhall’s overground station means a reverse commute out of London makes for a stress-free journey with all the benefits of Central London living. The Wandsworth Road itself is a bustling street with plenty of buses and a selection of local shops. One cannot deny that gentrification of the area is yet to really take hold but with a new development including a large Sainsbury’s supermarket nearby and the opening of the Northern Line extension, it is only a matter of time before more coffee shops and restaurants open up within the vicinity. That said there is still plenty going on in the immediate area and the locality is well known for its Portuguese community. South Lambeth Road, only a few minutes’ walk away, has a number of independent Portuguese restaurants and bars all offering a friendly welcome and good value food. What is great about the area is the opportunity to discover the hidden gems that London so often boasts and thankfully eludes the tourists. Just moments away from the tranquil bliss of the This Space development is the Cavendish Arms pub. Decorated as if by your a Gran with flocked wallpapers, royal souvenirs and gauche bric-a-brac, this arts pub hosts live entertainment every evening and never fails to amuse and surprise. Just as popular with the local crowd is Hot Stuff, the saucily named, Indian restaurant that attracts media types, young professionals and adventurous retirees. Writer, Will Self is a Fan. Those seeking more traditional English fare might like to visit the Canton Arms on South Lambeth Road. This hugely popular gastro-pub is almost single-handedly responsible for the increase in young professionals to the area. What started out as a student and local’s boozer has now become the place to eat when parents are visiting and the result has been that those seeking good investment properties have been charmed by the area and bought into the flats and developments for their offspring, recognising the growth potential.